Israel needs Russia, more than the latter needs the former in the Middle East. Even a Video Clip Intimidates «Israel»! The envoy, Kim Darroch, told a Washington think tank that British Typhoon aircraft currently deployed on a visit to Japan would fly across disputed parts of the South China Sea to assert international overflight rights, but gave no time frame. “Certainly, as we bring our two new aircraft carriers onstream in 2020, and as we renew and update our defense forces, they will be seen in the Pacific. The time frame of 2020 assumes that the United States will still have any significant presence in the region, somehow reversing the otherwise irreversible retreat it has been undergoing throughout Asia-Pacific over the past decade. Client regimes the United States and its European allies have cultivated throughout the region have either turned on them or have been effectively removed from power, or even the prospect of ever holding power again. The Philippines, quite literally a territory of the United States until the end of World War 2, and a nation that vacillated between independence from and interdependence with Washington for decades since, has recently become more vocal about perceived inequities in Manila-Washington relations. This is primarily because of the much more significant – and growing – ties Manila has with Beijing. In neighboring Thailand, Thaksin Shinawatra and his political opposition party were ousted from power in 2014 and have since been incrementally picked apart through legislative and judicial proceedings. Even as Shinawatra clung to power, Thailand’s establishment began shifting away from Cold War ties with the US and toward closer ties with not only Beijing, but also Moscow as well as its regional neighbors. In Myanmar, Aung San Suu Kyi and her National League for Democracy (NLD) party are increasingly hemorrhaging political legitimacy as her followers carry out what could be described as genocide against Myanmar’s Rohingya minority. The United States has cynically elected to draw an increasing amount of attention to this in a bid to prevent Suu Kyi from double dealing with both Washington and Beijing. Vietnam has recently showed reluctance to sign the US-initiated and dominated Trans-Pacific Partnership (TPP) free trade agreement, being one of the few nations in Southeast Asia to have agreed to it in the first place, while Cambodia’s previously pro-Western government headed by Hun Sen has become increasingly vocal about US meddling both in Cambodia, and across the region, openly taking Beijing’s side in the South China Sea dispute. Even Indonesia finds itself increasingly repelled by America’s overbearing stick and its increasingly unappealing carrot. Collectively, the region is attempting to rebalance itself to accommodate and cooperate with the rise of China, and create checks and balances in the void America’s mismanaged “Pacific Century” has left. It is perhaps ironic that the United States finds itself increasingly isolated in Asia amid its own attempts to isolate Beijing. It is also ironic that it is ending its “Pacific Century” the same way it began, side-by-side European nations attempting to impose Western interests on a region of the planet quite literally oceans away. However, unlike during the age of empires, the US and any European nation that joins it in Asia-Pacific today, will find a region of the planet on parity with Western technology, wealth and power. 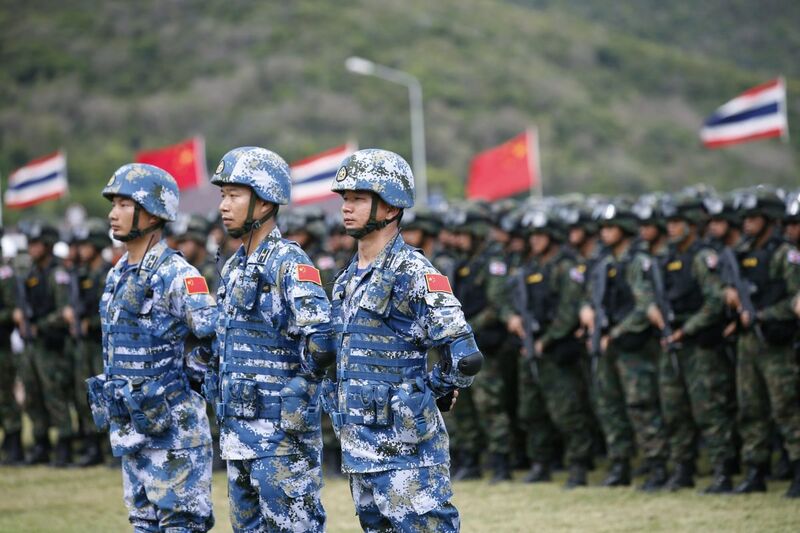 Militarily speaking, the number of facilities the US and its European allies can exploit in the region are shrinking both in number and in relative significance to growing Asian military power – including China’s expanding Pacific forces. However, in addition to military power, the US still maintains vast political and media networks throughout Asia. The US State Department’s Young Southeast Asian Leaders Initiative (YSEALI) aims to indoctrinate thousands of young Asian students and professionals, provide them with both fronts to operate as well as significant financial and political support to continue their work, all in an effort to transform the region’s values and principles to align with Washington’s interests. The National Endowment for Democracy (NED), its subsidiaries, and “aid” organizations like USAID all continue to build opposition fronts aimed at pressuring and altogether overthrowing political establishments across Asia. Together, this signifies a US that may be in retreat, but a US that still poses a potent threat to peace, stability, and prosperity across the region. The inclusion of British forces in Asia-Pacific to augment US provocations presents a threat to Asian stability. With Asia increasingly trading among themselves and with the rest of Eurasia, instability brought by US-European meddling is perhaps the only threat that could actually undermine “freedom of navigation,” trade, and economic growth – the very things the US claims its presence in Asia-Pacific is meant to protect.